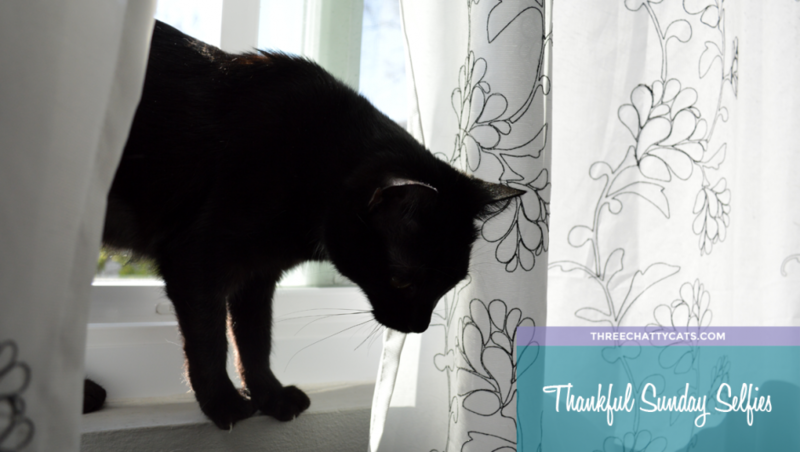 We here at Three Chatty Cats have a lot to be thankful for. So for our Sunday Selfies, we thought we’d pass along our thanks. 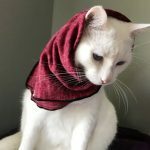 First off, a big thank you to Auntie Ellen – I mean the Tooth Fairy – over at 15 and Meowing for sending our little Olive some toys after her dental surgery, which I wrote about earlier. Ellen sent so many toys that Olive agreed to share some of them with foster cat Juno, who was excited to do her first ever Sunday Selfie! 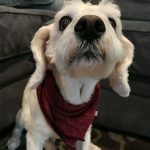 And although he rarely makes an appearance on the blog, our woofie Eddie wanted to pass along his thanks to Auntie Caren and Cousin Dakota. We entered and won Dakota’s “Oh Tiny Heart” giveaway. It arrived in the mail this week and I was impressed with the packaging and the obvious care and thoughtfulness that went into sending the scarf. Eddie chose the Taylor Burgandy Red scarf from the Oh Tiny Heart Signature Collection. Doesn’t he look dashing? He had just been to the groomer so it looks like he has chicken legs here. 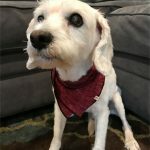 But at 15 years young, Eddie still charms all the ladies. For Sophie’s selfie this week, she wanted to let Cousin Cody know that he’s not alone. So, she agreed to wear the scarf, too. Check out what she’s referring to here. 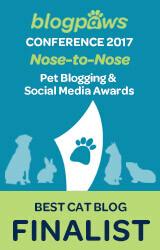 We found out this past week that Three Chatty Cats has been named a finalist for two BlogPaws Nose-to-Nose Awards. We want to thank everyone who nominated us and who’s been reading and supporting our blog. Your support and kindness mean the world to us! And a big congratulations to our fellow finalists! Our other blog, Cat Lady Alley, was also named a finalist for two awards. I can honestly say that I was shocked to learn this. So to whoever thought to nominate us, a huge thank you to you! 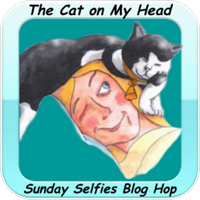 We’re joining The Cat on My Head for the Sunday Selfies blog hop. Here’s to hoping your upcoming week is filled with happiness, kindness and lots of furry friends. First and foremost, HUGE CONCATULATIONS on being a finalist in multiple categories….from photography, to information (which I know you carefully and painstakingly research), your interviews, your content, (I could go on and on), any accolades you receive are not only well-deserved they are greatly earned!!! 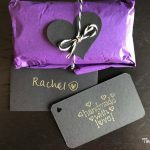 I knew from the moment I first started following you that your blog (and now blogs) were something special. Your blogs are also visually delightful and are set up to make reading easy. On top of all that, you are supportive and soooooooo nice to all of us!! Wishing you bundles and bundles of continued success! Now, Eddie looks soooooooooo handsome in red, I love the red and should have selected that for Dakota and Sophie? 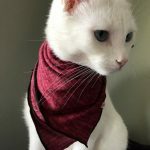 She looks stunning with her white fur in that scarf! Thank you for blogging about them. Thank you for all you do to help the animals too!!!! Love from all of us! Y’all really do look wonderful and it’s also so wonderful about your finalists nominations, big congrats from all of us! BIG congratulations on the finalist nominations – absolutely totally deserved we might add! We love your blog and the fact you do so many GREAT things for others is like icing on a delicious cake! Congratulations on your well deserved nominations! Thank you for the shout out about the toys and I am thrilled that Juno is enjoying them too. Great selfies with the scarf it really does suit! And a massive congratulations to you for all your nominations! That is quite an achievement! Hope to see you at blogpaws! You both look great in that lovely scarf. Concats on being a finalist in two Nose to Nose categories. Congratulations on all your nominations! I echo those above that congratulate you on your WELL DESERVED nominations!!! And, I send wolf whistles to all the models ;) Very beautiful. Eddie looks like such a sweetheart, and Sophie is totally rocking that scarf! And it was so sweet of Olive to share her toys with Juno. And you, my friend, are a total blogging rock star!!! A meowsy big ConCats. Ya’ll look adorable in da scarf. Awnty Ellen makes da bestest made with luv toys. And Juno looks just gawjus. Big hugs fur all. Loving the contrast in the fur and scarf colors! Love the scarfs….so nice of Ellen, sorry The Tooth Fairy to send some real nice exchanges for the teeths. Congrats my friends for the nominations on your blogs. They are both wonderful and enlightening. A big concats on your nominations! That is fabulous and we think everyone looks great in that scarf! I said it before but I’m gonna say it again.. CONGRATULATIONS!!! Congratulations on bein’ a finalist in TWO categories. Very well deserved, for sure. PURRS. I think Eddie and Rosie ought to form some sort of alliance since both of them don’t get much time on the blogs! And yes, Eddie is still a charmer! Congrats on your well-deserved nominations! Concats! Sophie, is that a hijab you’re stylin’? I love it! Enjoy your toys Olive. Congratulations on being a multi-category finalist! So well-deserved, and we are so happy for you, and proud of you! Beautiful selfies ! and congratulations ! What a fantastic post! You all look too cute in your selfies. Wonderful Ellen sure does make the best toys, doesn’t she? And, of course, a huge congratulations on these much deserved achievements! Concatulations on the nominations! We love Auntie Ellen’s toys – that are pawtastic. And the scarf is just fab. What a great scarf! It’s such a pretty color on you! Congratulations. We are tuned in! LOVE the pictures of Juno, Eddie, and Sophie! Congratulations on both well-deserved honors. These photos are so, so cute! Thank you for wearing our scarves so well! Model material. Wow, great job in being selected for being finalist in multiple Blog Paws Nose-to-Nose award “cat”agrees!! 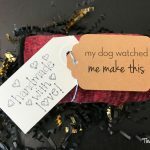 How pawsome for you! Mew Mew! Congratulations on the nominations! You deserve them! 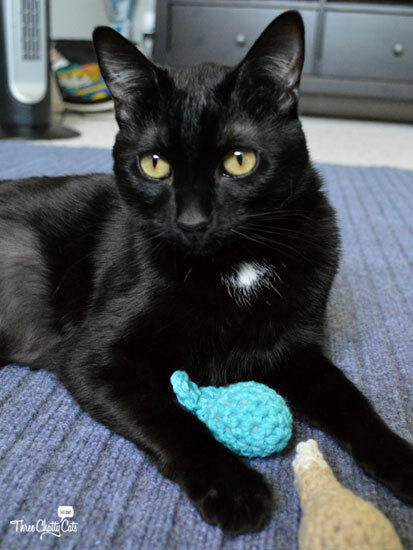 Juno your black furs look very attractive against the turquoise toy! You both look lovely in the scarf it is both Catable and Dogable! Well done on your Finalist places!! !